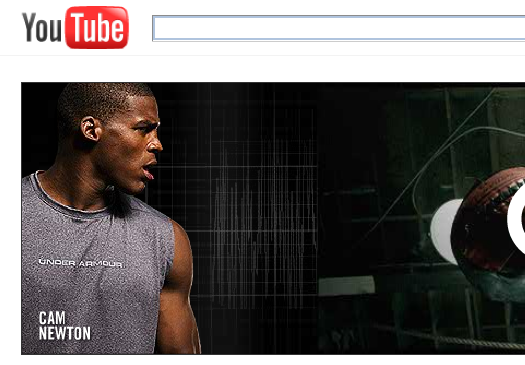 If you’re looking for clips of Cam Newton today, just got to YouTube.com…. and stay there. There’s no further searching required. As part of his assimilation of earth, the Blessed Individual is allowing Under Armour to hijack the header of YouTube.com for an entire day with a large banner ad incorporating the apparel company’s recently-released Newton-centric “Footsteps” commercial with links to an “Footsteps Experience” Facebook page featuring outtakes and behind-the-scenes footage. Yesterday, Newton scaled a building in Times Square. Related: Tom Brady meets Cam Newton. * War Eagle from Marwencol!